The Stuttgart 21 project plans the creation of two additional tracks on the Stuttgart-Ulm-Augsburg route for a top speed of 250 km/h. 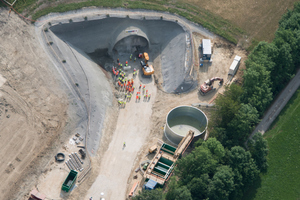 The altogether 60 km long new route between Wendlingen and Ulm passes through the Swabian Alb and 50 % of it will consist of tunnels. The 14.5 km long planning section 2.2 contains the 8806 m long Boßler Tunnel and the 4487 m long Steinbühl Tunnel. Both possess two single-track bores with a 60 m² clear cross-section, with a respective centre distance of 40 and 30 m, cross-passages every 500 m as well as a solid slab track capable of being used by emergency vehicles if need be. 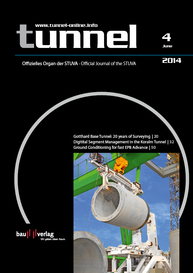 In order to reduce the sonic boom when trains are exiting the tunnels their portals are provided with domed structures with an enlarged clearance section and lateral openings to even out the pressure. 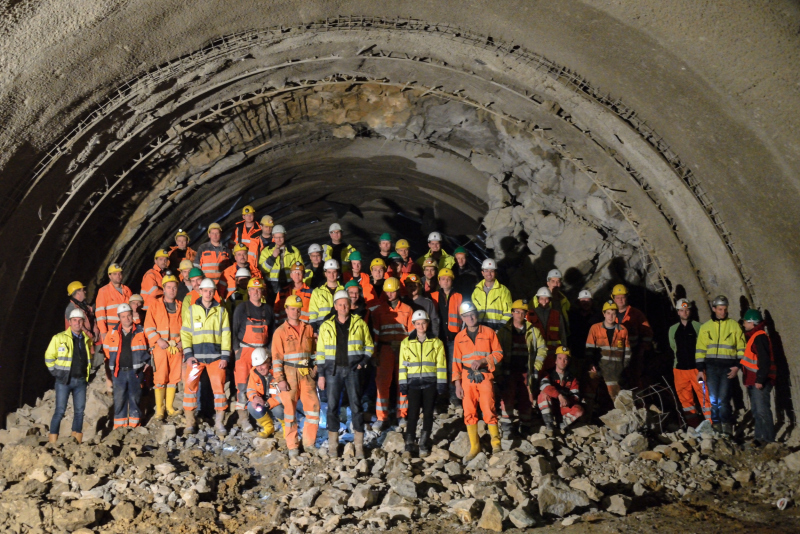 The Boßler Tunnel’s two single-track bores are driven from the Aichelberg Portal with a TBM on the rise and from the Umpfental intermediate point of attack on the rise and dip with the shotcrete method. 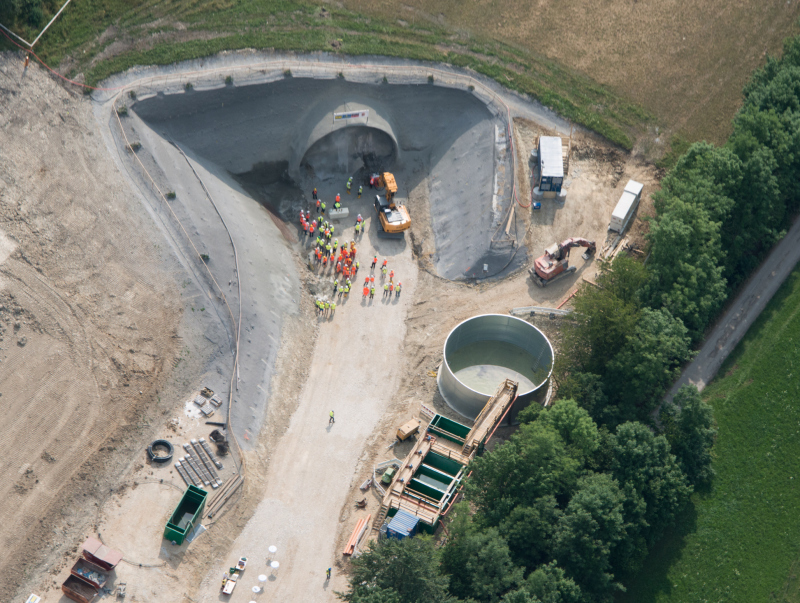 Likewise the Steinbühl Tunnel bores are produced from the Hohenstadt portal zone from an intermediate construction pit (Pfaffenäcker) by shotcreting. 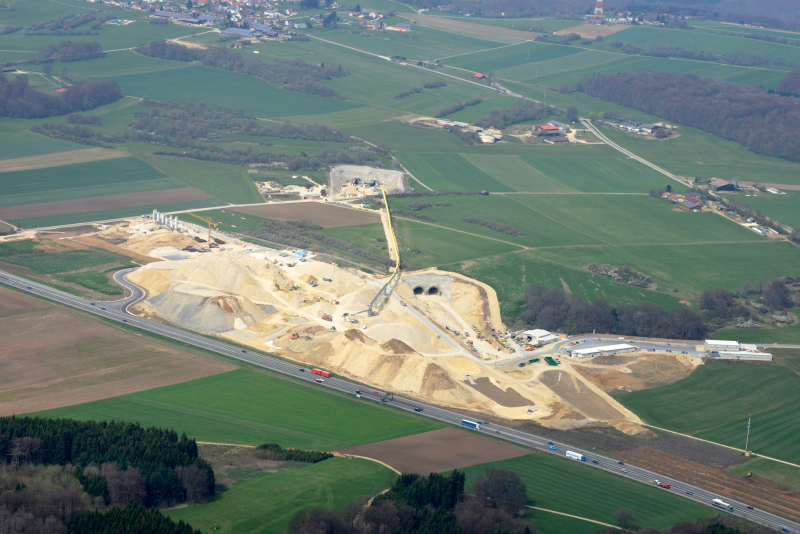 In October 2012, a joint venture headed by the Porr Group was commissioned to tackle the construction work for 635 million Euro. 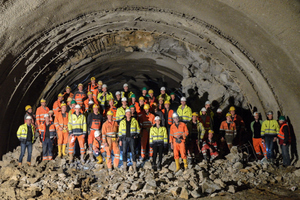 The first tunnel breakthrough was achieved in October 2013 and the second as from mid-December 2013. 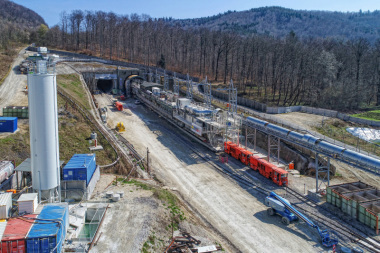 Since tunnelling commenced in summer 2013 more than 4.7 km have been driven collectively by mining means at the Umpfental intermediate point of attack for the Boßler Tunnel near Gruibingen and for the Steinbühl Tunnel near Hohenstadt up to mid-May 2014, given daily rates of advance of up to 8 m. The two tunnel bores of the Boßler Tunnel are being driven from the Aichelberg portal over 2800 m by a TBM in keeping with a special proposal. G.B.